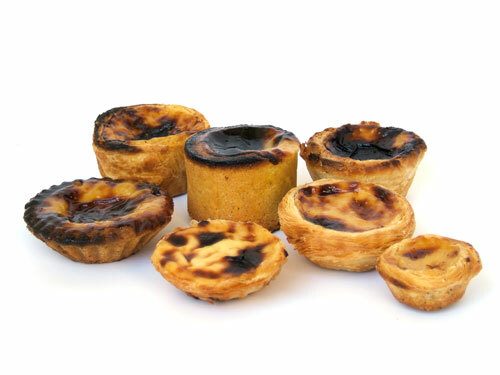 The Pastel de nata is Portugal’s biggest baking export. Flakey, custard-filled and slightly burnt on top, this small doughy tartlet is available across the world. The original pastel de nata, the Pastel de Belém, has been made by the same small factory near Jerónimos Monastery in Lisbon since 1837, using a secret recipe created by its Catholic monks. If you ask anyone in Portugal to name all the cakes they know, they could easily list over 20 right away. The pastel de nata (“creamy pastry”) is the most famous but even that comes in several individually named varieties: the original Pastel de Belém, named after the Lisbon district, has a thinner dough than the “classic” pastel de nata; what is often called the “natão” (or “big nata”) version is the same but extra tall; the “bom bocado” (the “good bit’) has a shortcrust rather than a puff pastry shell; the cylindrical “alsaciano” is the same as the bom bocado but with a crystallised cherry inside; and, finally, there is “miniatura”, a one-bite version of the classic – the kind of thing your aunt brings home by the dozen for tea. There is nothing refined or special about these custard tarts — they’re as much a part of our culinary landscape as espresso coffee or bread and butter. They are produced in a semi-industrialised way in pastelarias all over the country. The members of the nata family share a common basic form, but by catering to different tastes (and hunger levels) the variations meet different functions. They are a feature of Portuguese design that we often overlook. Originally Published in icon magazine, October 2006. Following Sugo’s Pirâmide article, this text made us really start thinking we were on to something. Previous The cake of all cakes. No, really.